Sainsbury's has been granted the right to a judicial review by the High Court over the ad watchdog's decision not to ban Tesco's Price Promise marketing campaign. The legal dispute erupted after the Advertising Standards Authority’s independent reviewer Sir Hayden Philips ruled Tesco was able to fairly match prices on non-branded products as part of its Price Promise. Sainsbury’s argues the Tesco Price Promise "compared apples with pears" by failing to take into account attributes including quality, provenance and ethics. In October, Sainsbury’s revealed it was seeking a judicial review of the Advertising Standards Authority’s decision. Following a review of the evidence, the High Court has now ruled it is "sufficiently arguable that there was an error of law in the ASA's approach to the matching of items for comparison, which error the reviewer failed to identify". The case will proceed to a formal hearing in approximately six months’ time. Mike Coupe, group commercial director and chief executive designate at Sainsbury’s, said: "We do not believe it is fair to compare own-label products of different supermarkets. "We strongly believe the quality of our own-label products is better than the immediate competition and this is a position we will fight strongly to protect." 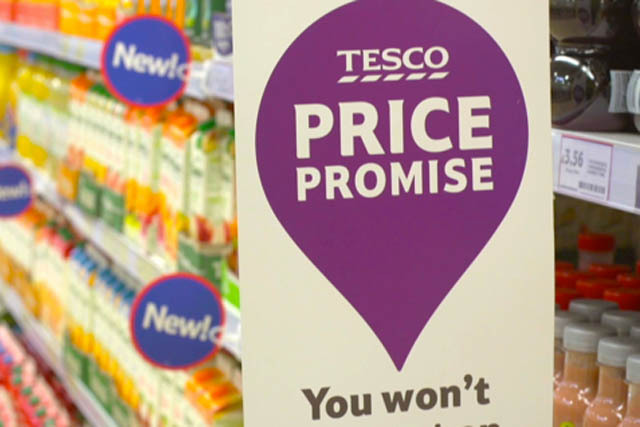 A Tesco spokeswoman said: "We know how much customers appreciate the confidence Price Promise gives them when they shop at Tesco. "Now that permission for the judicial review has been granted, we will robustly defend the way we make fair comparisons between products based on what matters to customers, which has already been approved by the ASA and the independent reviewer." Separately, Arcadia boss Sir Philip Green has reportedly claimed BHS will launch into the supermarket price war when it launches its food offering, by undercutting rivals' prices by 10%.